It’s always nice to read the words ‘You have been nominated for an award!‘ and this time it is from my blogging neighbor Lili & Mum’s!! Thank you guys! Love you back! You are very kind. As a part of the nomination I have to state 7 facts about myself. Well, there are so many things about me on the About page but I am sure I can come up with 7 more! I can communicate in 4 languages (Hindi -my national language, Marathi -my state language, Gujarati – my first language and English). I understand French, trying to learn Kannada (a South Indian language) and currently hooked on to Spanish. I adore Audrey Hepburn. I would like to believe that there is a little bit of her in me. I have been wearing spectacles since eight grade. I hate them. I have seen more than 250 movies last year. These include Asian, European, Russian and Australian movies. I am planning to break that record this year. Here are my nominations for this special award. 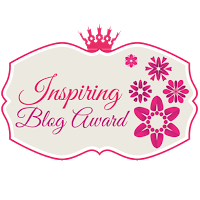 I didn’t have to think twice to nominate these amazing bloggers. They have given me much more than they know! Thank you for inspiring me dear bloggers and Congratulations! This entry was posted in Uncategorized and tagged Blog, Blog award. Bookmark the permalink. 10 Responses to Yay! An award! Whats stopping you!?? You just need to manage time.. trust me! I work, study and try to squeeze in some time for the arts! You go girl.. Good luck! I loved learning more fun facts about you! (I love Audrey Hepburn, too! What is your favorite of her movies?) Thank you SO much for nominating me. Truly, that is so kind. Sending cyber hugs from me to you.